Have you ever been working on your vehicle and then came across a stripped bolt or nut that you just couldn’t get loose? This is just one of many uses that locking pliers were specifically designed for. Not only are they a great tool to have in the garage, but they have so many uses that they are a must-have for any tool box. You can use them for pulling nails out of the wall, holding a nut while you loosen a bolt, cutting wires and more. Danish blacksmith, William Peterson, invented the first locking pliers in 1921 when he decided to combine the gripping power of a vise with the functionality and convenience of a plier. First known as vice grip pliers, they were created with the purpose of holding and preventing the movement of whatever you are working on, usually bolts and screws. They are great for reducing strain from your hand and allowing you to perform your task more easily. Locking pliers come in a wide variety of different shapes, sizes, and configurations, making them a versatile tool that can be used in construction, welding, auto repair, and much more. With so many different styles and brands to choose from, it is no surprise that you’re feeling overwhelmed. In an effort to narrow your search down to the perfect tool for you, we’ve reviewed some the top-selling locking pliers on the market and how they can help you! We start our list with the classic locking pliers from Irwin. This company has been making high-quality tools for over a hundred and thirty years and is one of the most trusted brands by professional tradesmen around the world. This features a curved jaw for easy gripping, and wire cutters that will come in handy anytime you work on electrical parts. It also comes with a hex key adjusting screw that allows you to vary the pressure. When using this type of tool, it is important that you can firmly grip whatever you need to stay in place. Irwin features a curved jaw with teeth that are hardened and designed to grip different shapes from a variety of angles. Convenience is major factor when trying to decide which tools to use. Irwin’s original vice-grip comes with the classic trigger release that is guarded and offers maximum locking strength that professional mechanics can depend on. Irwin is a well-known brand and backs all there tools with a lifetime guarantee. 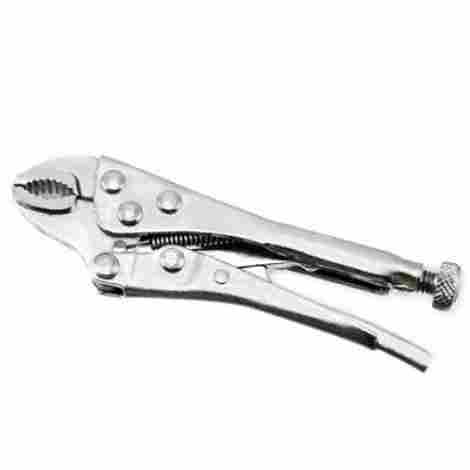 They use heat-treated, high-grade alloy steel to construct these pliers and ensure that you have tough and durable tool. Irwin Tools has another entry on the list with the twelve inch, large jaw vice-grip pliers. It is constructed of heavy-duty alloy steel that goes through heat treatment to increase durability. The large jaw has a maximum opening of 3 1/8-inches, and can grip around items of different shapes, making this tool ideal for working with larger objects such as pipes. It has a guarded trigger release that makes it easy and safe to use. Irwin understands that every job is different and that’s why you need a tool that can be versatile. This model has an adjustable screw that gives you the ability to modify the pliers to the exact pressure needed for every task. The large, heavy-duty jaw enables you to work with large objects and is great for clamping, tightening, and turning. It features hardened teeth that can grip easily is perfect for mechanics, plumbers, and welders. Whether you’re a DIY enthusiast or a professional tradesman, having the right tool can make all the difference in the world. This vice-grip tool is guaranteed to be free from defects in workmanship and material. Have you ever found yourself trying to grip a bolt or nail that was in a narrow and hard to reach place? Luckily, Capri Tools has designed vice-grip pliers for this exact situation. This six inch, long nose locking pliers features extremely strong teeth that can grip objects from a variety of different angles, allowing you to work comfortably and safely. 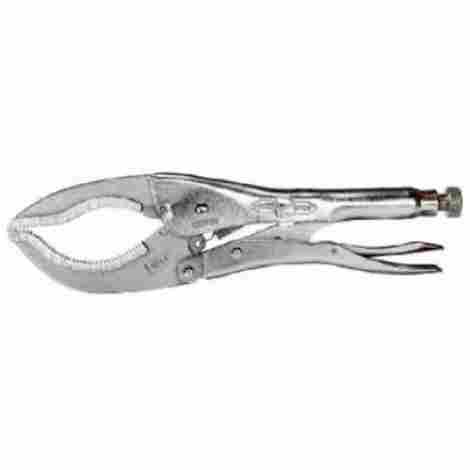 For added durability, Capri Tools constructed the jaws and teeth from Chrome Molybdenum, a form of alloy steel that is designed to handle high temperatures. This is great for working on engines and machines that heat up easily. It’s great having a tool that can do more than just one type of task. It’s not only cost efficient, but also convenient and time saving. The built-in wire cutter allows you to work faster and eliminates an extra tool from your already overloaded tool belt. Although this is one of the lowest costing vice-grips on the list, you still get a high-quality tool that was subjected to an extreme heat-treating process to ensure a tool that is more durable than most of its competitors. 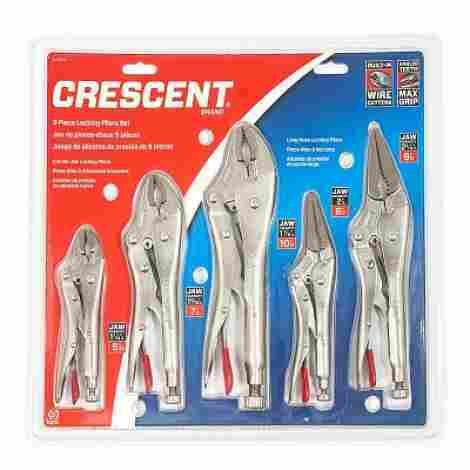 This amazing set from Crescent comes with five vice-grips in different shapes and sizes to ensure that you always have the right tool when you need it most. This includes five, seven, and ten inch classic curved jaw locking pliers, and six and nine inch long nose designs for getting into those hard to reach places. They are resistant to corrosion and rust and all come with an integrated wire-cutter. Tools can be expensive, especially if you are a professional who depends on their tools to make a living. So if you are going to invest, it only makes sense that you get something that is going to last. Crescent’s locking pliers set are all nickel plated to resist corrosion and rust for a lifetime of use. Safety is always a major factor anytime you are working with tools. These feature compound action that ensures a locking grip that you can count on. They also have a unique, angled tooth pattern that allows for a better grip and less slipping. All the tools in Crescent’s Locking Pliers set meet the strict standards set by the American Society of Mechanical Engineers. This includes product specifications for jaw opening capacity and strength. 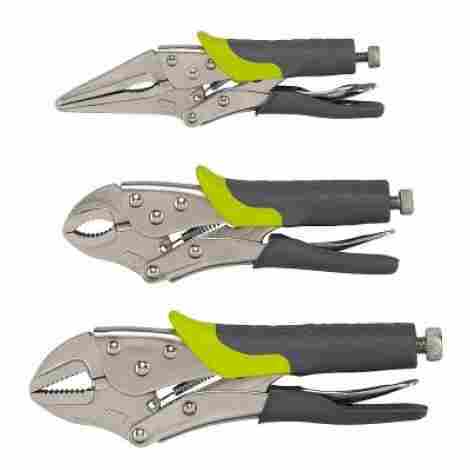 This three piece set of locking pliers from WorkPro was designed with the DIY’ers and homeowners in mind. After over twenty years of testing and studying tools and what works best, they have implemented everything they’ve learned to provide you with easy-to-use tools that are safe and dependable. This set include a 6 ½ inch long nose, a seven inch curved jaw, and a ten inch curved jaw locking pliers. One of the biggest advantages of using locking pliers is the strain it reduces on the hand. WorkPro takes it a step further and ads ergonomically designed grips that not only keep them from slipping, but also makes using them much more comfortable. Rust and corrosion plays a major role in the depletion and instability of tools. WorkPro uses electroplating treatment these tools to not only prevent this issue, but to also increase the strength of their jaws and teeth. For one incredibly low price, you get three high-quality tools that include all the features that make them safe and easy-to-use, including Thermoplastic Rubber handles, an adjustable screw, and a quick release lever. Grip-On has been developing, patenting, and making some of the best locking clamps and pliers in the world. They use the technology to solve tightening issues and manufacture innovative tools that lead to high customer satisfaction. Their ten-inch curved jaw vice-grip feature forged jaws with specially designed teeth that can grip and hold better than most of its competition. The threaded adjusting screw can widen the jaw up to two and a half inches for lots of grip room. If you’ve ever worked with this type of tool before, then you know how painful it is to get your skin pinched between the handle and the release lever. Grip-On uses a special no-pinch, quick-release design that will keep your hand safe and pain-free. Although most models have a screw that can adjust how wide the jaw can open and how tight it can close, not all of them are easy to use. The threading used on this screw ensures that you will never have difficulty tightening or loosening. This is the most expensive tool on the list, but is worth every penny. The redesigned teeth can firmly grip round objects at any angle and the forged steel jaws makes sure that it can withstand immense pressure. 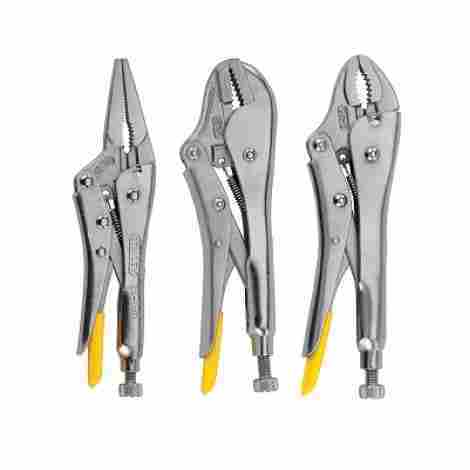 Craftsman combines quality and comfort with this three-piece set of locking pliers. They use rust and corrosion resistant materials for the body to ensure that the tools live up to the lifetime guarantee that comes with it. The set includes a six-inch long jaw, a seven-inch curved jaw and a ten-inch straight jaw that can be used for wide variety of different jobs. The metal screw on the end makes it easy to adjust to the needed amount of tension. Having the right tool can make your job easier, but having the right design can make your job more comfortable. The handles feature a soft rubber grip that will greatly reduce the strain felt when holding something in place with these. Rust and corrosion can really damage the structure of your tool, making it unsafe to use. Craftsman uses materials that are not only very durable, but also resistant to rust and corrosion, to give you a dependable and long-lasting tool. Craftsman tools are known and used by professionals around the world due to their quality and precision. The ergonomic handles, the easy to adjust screw, and rust resistant metal make these a must-have for every tool box. Knipex puts there tools through a variety of different tests to ensure durability, performance, and a long service life. They pay special attention to all the small details to make sure that the high demands of professional tradesmen are met. These details including how much carbon is used for hardening the steel, the design of the handle, and the angles, hardness, and sharpness of the cutting edges. Knipex designed this tool for heavy duty-work and convenience. It features a toggle lever action that provides incredibly high clamping pressure and the easy-to-turn adjusting knob and release lever can be operated with one hand. Durability is important when working on heavy-duty jobs. That is why Knipex used rolled steel to construct the body and chrome vanadium electric steel on the jaws and teeth for extra strength. This versatile tool can be used to hold flat and round areas, making it a great addition to any garage. It is constructed by high-strength steel and can be easily operated with one hand for extra convenience. This three-piece set from Stanley is made from strong forged steel that was designed for strength and longer life. The set includes a 9-inch straight jaw, a 7-3/8 inch curved jaw, and a 6-3/4 inch long nose locking pliers. Each tool features induction hardened jaws and built-in wire cutters. The adjustable knob at the end of the handle allows you regulate the holding pressure and how wide the jaws can open. Stanley uses an induction hardening treatment for the jaws to prolong its service life and provide a better grip. This treatment includes heating the metal and then quenching it until it goes through a martensitic transformation which makes it harder. Not all tools are built with the same quality and precision. Stanley has been building tools for over 175 years and understands the need for quality. That is why the tools in this set were made to meet all the specifications set by the American National Standards Institute. Stanley has a long and excellent reputation for building some of the highest quality tools in the world. Made from forged steel, these vice grips not only meet ANSI specifications, but they are backed by a lifetime warranty. Not all jobs require the biggest and strongest tools available. Sometimes you need something smaller to use on projects that require a little more precision or has limited work space. These mini locking pliers from SE has all the features you would find in a normal size tool, like an adjusting screw, self-locking design, and a strong body made from heat-treated metal that is nickel plated. There is nothing more frustrating than not being able to reach something because your tool is too large and won’t fit. This mini size tool is great for situations like this and has all the strength and durability you’d find in a regular size tool. Don’t be fooled by its size, SE constructed this tool with nickel plating, which is designed to strengthen the metal and protect it from wear. It is also resistant to rust and corrosion, giving the tool a long a dependable service life. SE is a family owned business that has been manufacturing high-quality tools in the United States for over 80 years. The metal used for the body is heat treated to increase strength and nickel plated to protect from wear and corrosion. As you can see from our list, locking pliers come in many different shapes and sizes and can be made from different materials. It’s important that you know what kind of jobs you will need it for before you make a purchase. Whether you enjoy working on projects around the house or you are professional mechanic, these tools can come in very handy. You may even decide that you need a set of three or five to make sure that you have the right kind of vice grip no matter what the project is. Straight Jaw – These types of tools have jaws that are straight and flat and can be used for a variety of different purposes. They are ideal for gripping and holding objects with flat surfaces, such as wood and sheet metal. Curved Jaw – These were designed with rounded or curved jaws and are mainly used to securely hold round objects like nuts, bolts, and pipes. These are a popular tool with plumbers and mechanics alike. V Jaw – This multi-purpose tool has a straight upper jaw and a curved lower jaw that allows it to be use on round objects as well as straight and flat objects and surfaces. Although these are more versatile, they don’t provide the same security the straight and curved jaw tools provide. Long Nose – Designed with a with longer and narrower jaws, the long nose mole grips, also known as needle nose, is the perfect tool for gripping objects that are in harder to reach due to confined or obstructed areas. Long Reach – These locking pliers have extra-long handles and narrow jaws that allow you to reach objects in confined spaces. These are ideal for working in wall cavities and motors. Large Jaw – These have wider jaws that have the ability to hold on to larger objects. They are used for heavy-duty work such as welding large pipes. Parrot Nose – These vice grips have specially designed jaws that are great for gripping and holding uniquely-shaped objects like hexagonal nuts. Because of their odd shape, these tools have limited use and better suited for specialty jobs. 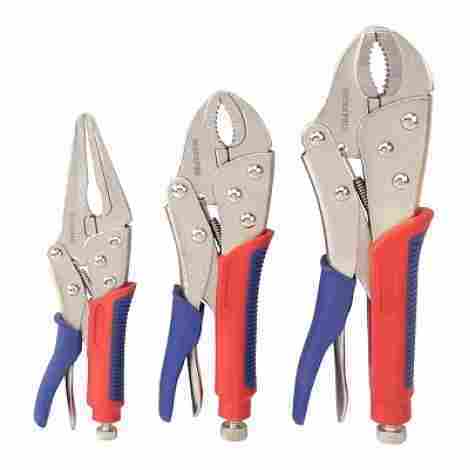 Mini Locking Pliers – These smaller than standard mole grips at around four inches and perfect for detail and precision work such as model making. They are not usually as durable or strong as your standard tool. 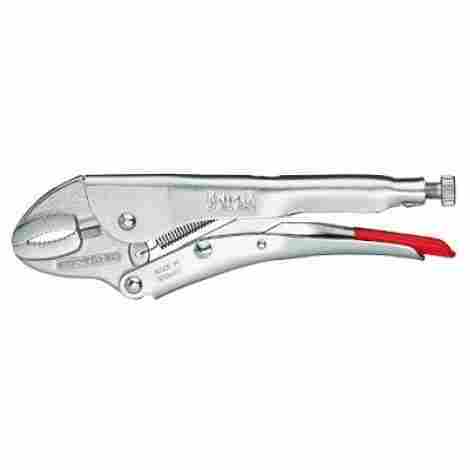 As you can see from the list above, there are a wide variety of locking pliers with jaws that have different shapes, sizes, and textures, which impact what types of activities they are suited for. So before making a purchase, think about what kind of work you expect to be doing with your tools? If you are a mechanic and need something to hold screws or bolts in hard to reach areas, then a long reach or long nose mole pliers may be the right jaw design for you. If you like working on small projects around the house, than maybe consider straight jaw vice-grips, which are perfect for gripping and hold objects with flat surfaces. Plumbers would probably best be served with curved jaw locking pliers that can securely clamp on to round objects like pipes. Other aspects you need to take into consideration are how wide the jaws can open and how much they can close. If you need a tool that can grip and hold two pieces of plywood together or a large pipe that needs to be welded, then you’ll large jaw mole grips that can open wide enough to safely do the job. If the object you need to work on is smaller, then you’ll need something that leaves little to no room in between the jaws when closed and locked. Test the tool to see exactly how the shape of the jaw changes as the handles open and close. These tools were designed to grip and hold an object securely, and to do that safely, most of them have textured jaws that are known as teeth. Sometimes the teeth will be made with a different material than the rest body to make it harder. You’ll want to check out the texture and pattern of the teeth as it can have an effect on the object you are working on. If the teeth are too aggressive and you are working with a softer materiel, like wood, plastic, or a soft metal, it can get damaged. If the teeth are not aggressive enough, then the grip may not be as secure and the toolcan slip. Comfort and safety should always play a major role when deciding which is the right tool for you. And for locking pliers, that lies heavily with the design of the handles. Unlike other types of pliers, most locking tools will be made with a metal handle. Check to see if there is enough texture to allow you to have a firm grip while working, but not so hard that you feel pain or strain in your hand. There are some models that have padded grips, and this can relieve a lot of the strain. If you do decide to get one with padding, make sure that the material doesn’t slide or move when under pressure. Other issues to look out for include materials that wear out too fast or react negatively to the extreme temperatures it may face during work. Too much padding can be a hindrance and may impair your reach. Handles that open too wide can also cause problems. Check to see how well you can handle the tool with one hand. There are some vice-grips that open up to almost ninety degrees, which can make it difficult to handle in tight spaces. On the other hand, tools that are built to be small and compact can compromise how firmly you can grip it with your fingers. The locking function on your tool is commonly found on the end of the handle or where the handles connect near the joint. You’ll find that most use some kind of screw for adjusting the pressure, check to see how easily you can rotate and change the positions. Other models have a ratchet of pump locking design. The important thing you need to look for is, when your pliers are locked, they need to stay locked unless you intentionally unlock them. You want an easy and quick release system, but not one that can accidentally unlock when bumped or hit. Check to see if you can use one hand to lock and release it. It is important that you feel confident in the structure and durability of your tool, especially if you work in a profession that requires heavy-duty work. For the most part, alloy steels are usually used for the construction of these types of tools, but you will also see that some also use other metals such as high carbon steel, chromium alloy, and chrome or nickel plated for more strength and resistance against rust and corrosion. Q: What is the difference between regular and locking pliers? 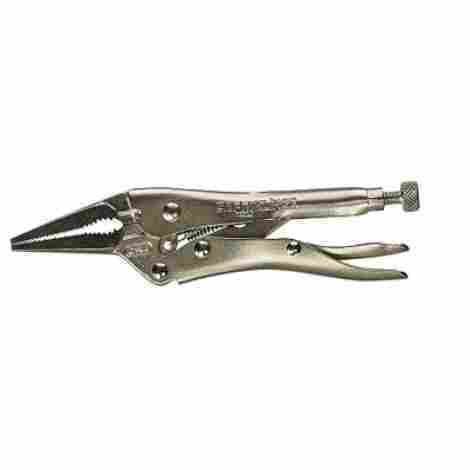 Regular pliers are made of two pivoting jaws that depend on your brute strength to bend, hold, turn, or cut objects. They have the advantage of being easier and faster to relocate because you don’t have to adjust, lock, and release every time. Locking pliers is designed to lock on to whatever you are working on and feature more working parts, including an adjustment tool, locking mechanism and a release lever. Using this tool frees up one of your hands, and reduces strain from the hand holding the pliers since you don’t need to use any pressure to keep it in place. Q: Is there a difference between locking pliers, vise-grips, and mole grips? They are all actually the same kind of tool with the same functions. Vice-grips and mole grips are actually just the trade names given to the tools by different tool manufacturers. How they are referred to also depends on the region on the world you live in. Hobbyists and professionals in the United States usually call them vise-grips, while in the United Kingdom they are referred to as mole grips. A: If this is your first time using vice-grips, don’t worry, they all pretty much work the same way. First you’ll notice that the tool has a screw or ratcheting system that allows you to regulate the spacing between the jaws. Once the ideal setting is achieved, squeeze the handles until the jaws close around the object you will be working on, you should here a click that lets you know the tool is locked in place. When you are done with your task, press the release lever to unlock the jaws. Q: What can I use locking pliers for? Clamping – The ability to lock into place and hold objects together may them ideal for jobs that include metalworking and woodworking. Holding – If you work with materials that uncomfortable or unable to hold due to heat, cold, or other conditions, the tools gripping power allows you to maneuver and work with them. Some vice-grips are also designed to work in small spaces where you wouldn’t be able to use your fingers. Pulling Fasteners – Because they can clamp down on an item with so much force they can be used to pull out staples, nails and other fasteners you may not have the power to do with regular pliers. They can also be used to extract bolts, screws, and nuts that have stripped or damaged threads. Lever or Knob Replacement – Have you ever encountered a situation where some kind of control handle, like a lever or knob, becomes damaged or breaks off? Don’t worry. Thanks to the holding power of these tools, you can use it as a temporary replacement until you have repaired or replaced the component. Pinching off Leaks – If you have a leaky pipe and need a quick fix until a professional can get to it, you are in luck. You can use it squeeze a pipeline or tube closed and temporarily suppress the leak. 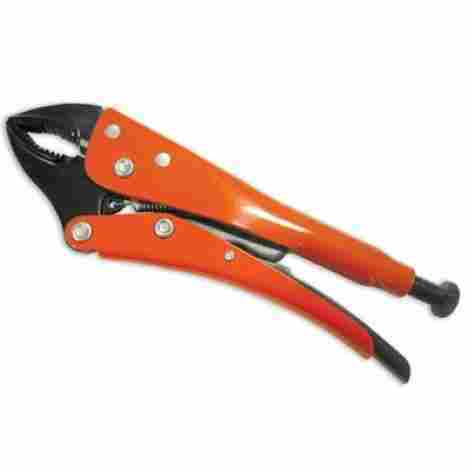 Wire Cutting – Although not all locking pliers come with this option, many do and it can come in handy. If you are using your tool to shape, bend or hold wired together, having the ability to cut it when necessary is very convenient. 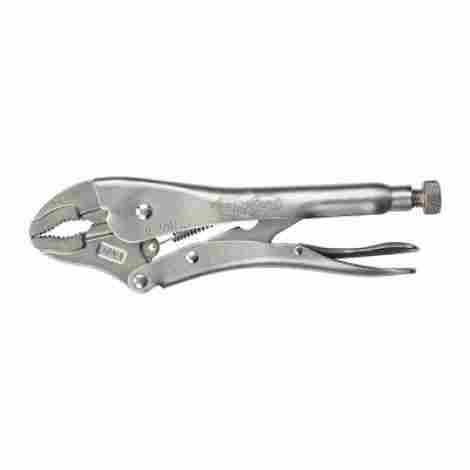 Squeezing and Pressing – Locking pliers are designed to exert a large amount of force, which makes them ideal for jobs like crimping wire connectors and fixing chain link fences.